Is it possibile to speed up the loading of the pages like with an automatic preload of the next 5-10 pages? Any suggestion to speed up the program? thanks for the kind words - and thanks for the post. edit --> Preferences --> Performance. There you can allocate tweak memory usage as well as threading if your hardware supports it. I just tried to give more memory to the program using the tweak. I use PDFXchange Viewer with the Full screen mode (F12 keyboard shortcut). It seems that pages are loaded faster only when they are already seen at least one time. I mean that if I want to go the next page and I haven't see yet that page, it takes anyway a long time to load. Unfortunately I am studying on a couple of pdf book that are quite heavy (scanned + OCR). how does the performance compare to other PDF readers? I guess that ultimately is the question. Would it be possible to send us the PDF in question for us to take a look at? I'll try to guess what this is really about, please correct me if I'm wrong. Maybe what attorianzo wants to avoid is flickering between pages. Presently PDF-XChange Viewer does avoid flickering, but only after each page was displayed at least once. This should be an easy implementation for the developers. Welcome to our forums. Yes it could be the flickering indeed - and this was solved in the Viewer with it caching a raster image of each page it had already rendered - something that is rather memory intensive and with the generally faster rendering of the Editor maybe not so necessary. It's up to my colleagues designing the products to decide where a similar solution should be implemented in the Editor. Many thanks to everyone in this topic. The thing is that you have to render the pages at least one time before to get a comfortable speed. Is it possible to give the possibility to the user to preload the next 5-10 pages (or more, giving the user the possibility to decide the amount of pages according with his hardware). 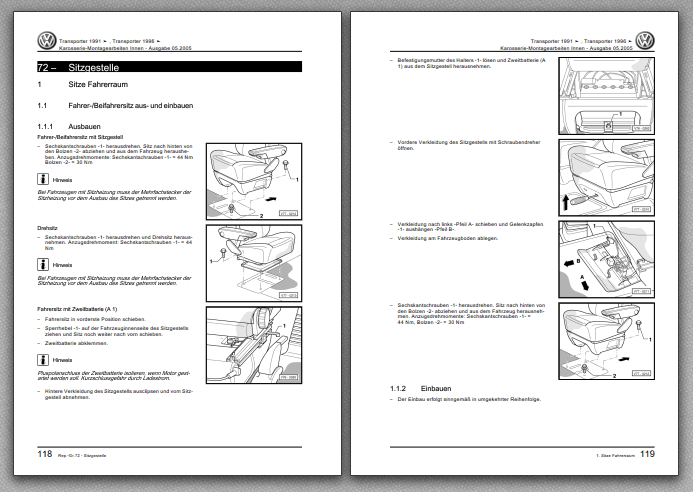 The pdf book that I have is very heavy in rendering because every page has been scanned (+OCR). Tracker Supp-Stefan wrote: ...to decide where a similar solution should be implemented in the Editor. 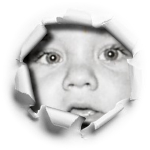 Aren't we talking about the viewer? I don't even have an editor, my version is the free one. Thanks for the posts - if you're using the Viewer here, then could you please download and try the Editor? The Editor is the direct replacement for the Viewer and only critical fixes are being applied to the Viewer. I suspect that this would not count as critical. If using the Editor does not help, then please do send the actual PDF file, as we would need to test here to see if anything further can be done. What the Editor already seems to do at present, it caches ALL pages of the current document(s) AFTER they at least have been shown once. Thus, after having scrolled through the entire current document ONCE, every subsequent scrolling seems to be even smoother and faster (than the already incredible speed of the Editor). That is even more the case for the thumbnails pane. Other than its competitors, PDF-XChange Editor also caches all thumbnails AFTER they have been shown at least once in the thumbnail pane. Simililarly, the unbelievable text search speed of PDF-XChange Editor is "only" reached AFTER the very first text search, which seems to cache all text of the entire file, making every subsequent search almost as fast as the speed of light. c) pre-rendering and caching all pages of the entire file, at the current zoom level (enabling smooth and fast scrolling even in heavy files from the very beginning). Since the Editor does all three things (a, b, and c) anyway later on (when the user scrolls and works his way through the file) this would also not mean that it's a waste of resources or memory. Rather, it would make the already fastest and smoothest PDF software on the planet even more fast and smooth. PDF-XChange Editor eventually would end up in a league of its own, unassailable. Thanks for the patience here - I've just spoken with the Dev. Team and they feel that this would be practical to implement. I don't have any timeline for implementation, but it's now on the map. Will - Tracker Supp wrote: I've just spoken with the Dev. Team and they feel that this would be practical to implement. Thank you Will -- amazing response time for the request, as always! 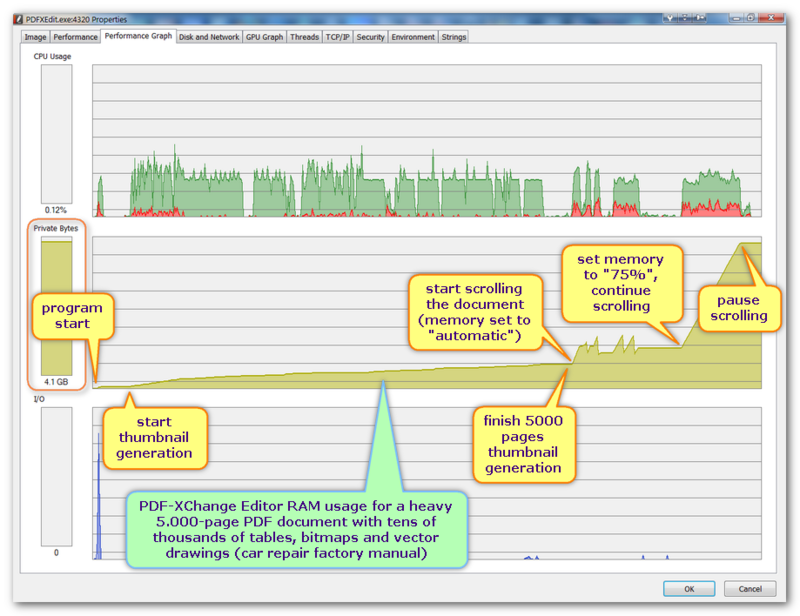 Below an exemplary screenshot about RAM usage in an extreme case (heavy 5000 pages PDF file). The RAM consumption in my view is not a problem either, because it only happens if enough RAM is available in the respective users system -- and if plenty is available, it should definitely be used, if it speeds things up (as it does with PDF-XChange Editor). Last edited by David.P on Thu Jan 23, 2014 1:13 pm, edited 1 time in total. And that is already fixed and the fix should be in build 307.2 planned for Feb. I would however not advocate that the behavior of PDF-XChange Editor in the present case, especially the amount of RAM usage as seen in the screenshot above, would have to be called a bug, neither needed to be fixed. Rather in this case, I'd say it is a feature since it is perfectly understandable that caching thousands of fully rendered pages CAN take Gigabytes of RAM. In the case you mentioned however there probably had been a bug of some sort. It's been two weeks I'm using Pdf xchange editor instead of pdf xchange viewer. It seems a little bit faster than the viewer in my opinion. Very good job! - The pre-load next pages function, better if it is the user choosing how many pages he wants to preload without having ever seen them yet. 2 - I have used the split pdf function to make the big pdf I'm studying more manageable. I often save my pdf to not lose my annotations on it, so smaller files means faster save. Very useful the search function on folder with pdfs: Autosave function every X minutes on a temporary file? 3- Full screen function, with zooming possibility (and, of course, the preload next pages function). I don't need the instruments bar seeing that I have my keyboard shortcuts, and I have only a 15 inches screen (my laptop). Thanks for this software, I think I'll buy the pro version. Thanks for your comments. We are indeed considering Pre-load and Autosave, and Full Screen View is already in development and should be available in one of the next few builds. Pre-rendering of all pages is not possible, I think. That is because either decoding itself, or maybe just the rendering part are calculated and cached for the current zoom setting/page size. One you change zoom all those pre-cached pages would be useless unless you change back to the same zoom setting later. So Adobe's approach of only pre-rendering a couple of pages makes sense (preferably in both directions, beginning with the average direction used lately). Pre-rendering in this manner is, I believe, what we have planned for the Editor. Timur Born wrote: Pre-rendering of all pages is not possible, I think. That is because either decoding itself, or maybe just the rendering part are calculated and cached for the current zoom setting/page size. One you change zoom all those pre-cached pages would be useless unless you change back to the same zoom setting later. So Adobe's approach of only pre-rendering a couple of pages makes sense (preferably in both directions, beginning with the average direction used lately). Absolutely correct. In my case however this usually is not a problem, because I always use split+single page+full page view on my three 24" 4K monitors, therefore the zoom factor usually does not change, and the cached pages can be continually re-used. However, I agree that it should suffice to always pre-render a couple of pages in both directions of the current page. In my view, text caching of the entire document is most important (for blazing fast search), then thumbnail caching and finally caching of rendered pages . Thanks David, we'll keep this in mind. Thank you Will, that's great and much appreciated! I think I posterd somewhere that Adobe Reader pre-renders up to 8 pages in the direction you last used, depending on how much idle time you spent on the current page (more pre-rendering if you stay on a page reading, less if you flip quickly). I guess it makes sense to only pre-render one or two pages backwards and the rest forward when you jump to a page directly. For normal reading it should pre-render to the last direction used. An option/button to decode the whole document text for searches might be useful. No idea how this is currently handled. And once the disk cache is fixed I would like an option to keep its content over several session, the same way shader caches of GPUs work. I keep opening the same image heavy documents dozens and dozens of times, no need to render them anew every time. SSD space gets cheaper and cheaper. Timur Born wrote: An option/button to decode the whole document text for searches might be useful. No idea how this is currently handled. Currently, the entire document text is placed in the RAM cache as soon as you have completed either one Search or one Find operation. Subsequent searches feel like they are about 20 to 100 times faster. Unfortunately, this cache is also flushed after every couple of minutes. Thanks guys for all the detailed suggestions. The development team are aware of these requests and will implement what they consider reasonable. At the end of the day it will be up to the Development Team Leader's discretion. I doubt that anything in this arena will change before the next major version. We'll have to wait to see what is adopted here and what doesn't make the cut. Time will tell. Most likely we'll know more in the early autumn. Looking forward to any news regarding this feature! I would like to second the request for a preloading feature. The reading experience with certain types of heavy PDFs, the already mentioned scanned documents, is subpar. Ideally, you would add a setting to the performance preferences where the user can configure preloading to arbitrarily high values. I myself, and I can imagine many others, use the program not just for editing PDFs but also for viewing. And I'm not talking novels, which are read in a linear fashion. With novels it suffices to preload the next couple of pages. That's true. I'm talking about non-fiction books, specialist literature, technical documentation etc. With these types of files, one jumps around constantly from position to position. One flips through half the book back and forth to find the relevant passage. It's immensely deterring, if you have to wait half a second to a second for every page to render. That the cached images are only usable for a specific zoom ratio is a nonissue. If I read a document, I set the viewmode once to "fit page" and don't fiddle with the zoom. This way my eyes can scan the whole page in a split second. Less time than it takes to render that friggin page. Just like David P. does. Unsurprisingly, because that usage pattern comes naturally for everyone who reads a pdf file the way a reference book is read. I have 16GB of RAM, a common size for a modern pc. Workstations often have 64GB or more. And often reading that PDF is the single task at hand. It's super frustrating to see all that RAM go unused just to endure those rendering delays. I'm not intending to be all negative. All in all, PDF-XChange Editor is a tremendous product, that I enjoy using very much. It's just, that the described scenario is highly common for my usage. Implementing this feature would be a game changer for me and make an already great product truly perfect. Did the page pre-loading feature make it into version 7? Or is there a plug-in available which reads ahead for caching pages? I am afraid that unfortunately this feature is not yet ready, but it is in our list of features for sure! Any time-frame on when this very useful (some say important) feature might be (re)implemented in Editor? Adobe Reader pre-renders several pages in the last used direction, which even on a very fast PC makes a very considerable difference. I cannot confirm this for 324.3, I switched synchronous rendering from Auto to Yes and see no preloading (one of the open documents would take several GB of RAM being preloaded on its own). Cache is set to 75% (of 16 GB) and life-span to maximum. Have you tried scrolling after enabling this option? Also did you restart the editor after changing this option? If the document is in the current sessions memory it will use that instead of reload it (which in your case is still on the Auto setting). Yes, I tried both restarting Editor and scrolling some pages. The scrolled pages were cached, but the rest was not. I also closed and reopened the document in Editor. 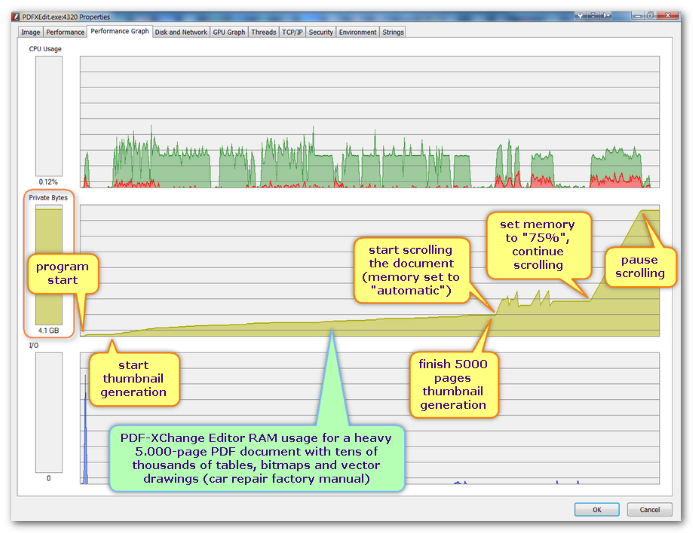 No CPU load was happening and no additional memory was allocated by Editor (except for the manually scrolled pages). Most people would consider it a good thing that their system resources are not entirely consumed by a single document, so could you please explain in detail, exactly what the complaint is and why you believe this has not been addressed? I thought we were talking about pre-rendering/loading one or more pages into the memory cache, did we not? So when you flip to the next page(s) you get an instant display of the content instead of having to wait for the computation to finish. This allows for a more lag-free experience when reading and flipping through more complex PDF files/books. Of course Editor already is considerably faster than Adobe Reader where it comes to rendering uncached pages, sometimes even faster than Reader's cached results. Still pre-rendering is useful. I've recently built a new system and PDF XChange is performing the same as it did in my 5 year old system! My new system has A LOT of spare overhead and resources just sat there doing nothing UNTIL the next page is requested and loaded into the RAM cache. Once it's been cached it's blistering fast to scroll through. So it appears that the only bottleneck I have in my New PC... is my physical scrolling speed ! If a handful of preceding pages could be automatically loaded into RAM in the background (I'm pretty sure even entire documents could be loaded into my 128gb RAM...) then the speeds would be incredible for quickly skimming through image heavy documents such as artbooks and magazines (these would benefit immensely from background pre-loading!). Thanks for reviving this topic. Indeed we can also see the benefits of pre-rendering of a few pages ahead - especially in image heavy files, but as this is a complex task - we have not yet been able to allocate the resources needed for it's implementation. Would love to see prerendering implemented. this is currently not high on our priority list, mostly due to low demand and the complexity to implement. To the best of my knowledge, Adobe no longer do pre-rendering possibly because it does not always improve the user experience, especially when there are limited resources and RAM is being swapped. Sometimes we would pre-render pages that are never even viewed and that is quite a waste of resources. I appreciate that on your system this is not such an issue today, however we are bound to make the software as useable as possible for as many people as possible. So I would not expect to see this any time soon I am afraid. I just checked Adobe Reader DC 19 and it still does pre-caching in the last reading direction, just like it did for ages already. Pre-caching was not a resource hog years ago when CPUs and RAM were less powerful and it surely is not a resource problem today. Pre-caching the next (few) page(s) is a sure bet most of the time and costs minimal resources, especially as an option that can be enabled/disabled.